Flatbed digital printers use inks made of acrylic monomers that are then exposed to strong UV-light to cure, or polymerize them. This process allows for printing on a wide variety of surfaces such as wood or metal, carpet, tile, and even glass. The adjustable printing bed makes it possible to print on surfaces ranging in thickness from a sheet of paper often up to as much as several inches. Typically used for commercial applications (retail and event signage), flatbed printing is often a substitute for screen-printing. 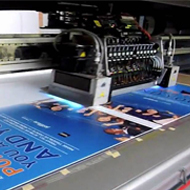 Since no printing plates or silkscreens must be produced, digital printing technology allows shorter runs of signs to be produced economically. Environmentally, flatbed digital printing is based on a more sustainable system than its commercial predecessor of solvent printing as it produces fewer waste cartridges and less indoor air pollution.The resolution of flatbed printers range from 72 DPI (dots per inch) to about 1700 DPI. One of the advantages of a flatbed printer is its versatility of printable materials although this is limited to only flat materials.